We will send you a confirmation to the email address that you registered with after your registration has been completed. 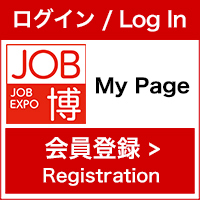 Please check the e-mail, and bring your tickets of the event and seminars to the JOB FAIR.You need to prepare the number of tickets for the companies you are going to attend on the day. Stationary and Tickets. It is not necessary to bring printed CV however, if you have one, please submit it in receptionist on the day. *We will ask for submission of an attendance sheet at the reception if you do not bring your ticket. Reception opens from 10:30 till 17:30. Please give yourself a plenty of time to see around as many companies as possible and gather related information for your job-hunting in Japan. Please contact the Job Fair office（ globaljob@pasona.co.jp）by email.